I was asked if I assign ethnicity to my stamps. The answer to that is no. These are line drawings with no faces so it's a bit difficult to do that. Long before my stamps came out and I used templates in my classes I noticed that African-American ladies were shading in their dolls. That's when I brainstormed the Buff Paper Pad in all different shades of skin tones and working with a company such as Prima gave me the opportunity to do that. About 6 months after the stamps came out I had several requests to make ethnic stamps. Hispanic, Asian and African -American....how does one do this when there's no faces? I do have a HUGE following of African-American ladies whom I love and adore so I really had to think my way through this one. So, meet Taylor....I was told that an on-line shop was selling her as an African-American stamp. Well guess what? She is a line drawing and can be whatever you want her to be! As I waited for my answer to come to me on this dilemma of ethnicities, this is what I drew. This is what came out of me. I believe she could have the lightest of skin tones and red hair and look as Irish as can be. Even add a few freckles to the mix! Make her in a dark skin tone and voila, she is African-American! She was totally inspired by all my lovely ladies of color who follow me. It dawned on me as I was thinking through this that I did not have many curly haired gals. These women have been purchasing all my stamps, straight hair and all using darker skin tones, making the most wonderful creations, without a complaint whatsoever. Curly hair is hard for me to draw so I've avoided it for the most part up to now. I then knew I needed to add some curly hair to the mix! Taylor happens to have short hair but I added some longer curly hair to some of the other girls. I hope this answers the questions. Creative ladies from all backgrounds, colors, shapes and places have made the dolls however they want them to be. That's what we creative people do. I hope ladies of all colors enjoy making creations with this stamp however they see fit. I can't wait to see the end results! Thank you so much for thinking of women of all ethnicities! As a woman of color it is exciting to see that someone in the scrap/card industry is thinking beyond the "norm." I love all of the dolls that you have created and was so happy to also see the paper pad with the different color skin tones. Keep thinking, creating and including all women along your journey! Thanks so much!! I totally agree with Kim's comment. I am Hispanic and we come in different skin tones and I love that your dolls are a blank canvas. Just bought her and I LOVE her! I love your creativity! Your stamps are so beautiful. I wish I had them all. I'm slowly expanding my collection and having fun with each of my new girls. Thank you for creating Taylor. I can't wait to add her to my collection. I love her too. I tell you what though, she is hard to find. I bought Taylor just a couple of months ago before I read this post. In thought she would be useful for the 'ethnicity' reason as I have friends, colleagues and family of all persuasions and I have often felt that this is a very poorly supplied area. She works great however you want to colour her though! Hello, and yes, I agree with all of the above comments. Please excuse the late comment as I am relatively new to sewing and crafting, and enjoy time spent with my granddaughter who loves creative art. 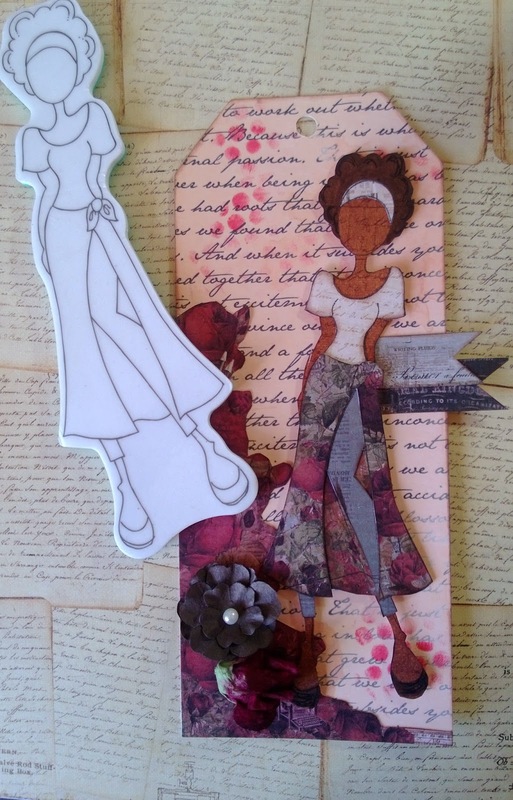 When I came across Julie Nutting's book "Collage Couture" I was ecstatic! My granddaughter loves art creations; and also, to create and design clothes in her 11year old world. Further research for Julie Nutting brought me to your doll stamps, and a tutorial where you mentioned the varied flesh tone paper pad. In my family we teach our children ethnic diversity, and to see themselves as part of the whole picture. So, I am delighted that your stamps include Taylor. I will be visiting my granddaughter in a couple of weeks, and have ordered a few+ of your stamps. While Taylor is on back order I feel certain that she is going to love the stamps I was able to purchase. There is a market, so please keep them coming! Thank you for your creations to include all girls, and women.